Perfect WordPress landing page theme. It is 2015 and you need a powerful new theme that will enable you to build sites fast and easy. Your sites need to work better on mobile and provide the best possible conversion rates you can get. 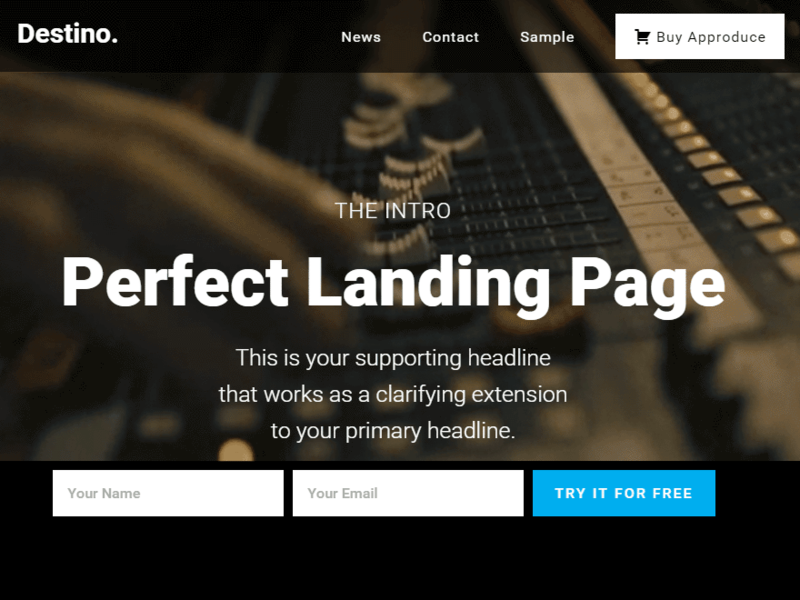 Destino is the best WordPress landing page theme that is packed with elegant new design and tighter integration with popular productivity plugins. It’s never been easier to get more conversions and power for your website. It’s never been easy to deploy your landing pages and it’s never been easier to attract more sales. Theme is built with all WordPress and coding standards in mind. It truly strives for fast loading times and the best search engine visibility you can get. The only thing it needs is some of your content and you are ready to roll. It doesn’t get much easier to edit your website. You will edit and publish your website pages faster than ever. Create any layout imaginable, sit back and watch your satisfied customers admiring your dedication to details. It’s easy to find, create, share, and do just about everything for your business with Destino. We went extra mile to integrate most popular WordPress plugins. It just works. All of them. Out of the box.